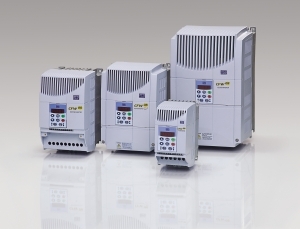 WEG, the global supplier of motors, drives, controls, transformers, and generators, has introduced its CFW-08 Multi-pump AC drive, a new system that saves energy in pumping systems, by allowing the control of up to four pumps from one variable frequency drive (VFD). "There are multiple advantages to installing a Multi-pump variable frequency drive system," said Graham Johnson, senior drives engineer at WEG UK. "These include energy saving, extended operating system life, system default diagnosis, constant line pressure and pump operation time equalisation." By controlling up to four pumps simultaneously, the WEG CFW-08 Multi-pump system enables constant pressure to be maintained in pipelines regardless of fluctuations in outflow demand (Fig. 1). This is achieved using a PID controller in conjunction with the auxiliary pumps' start/stop logic. In addition, the CFW-08 also monitors the pressure and level of the capture reservoir, and provides minimum output pressure fault monitoring for broken pipes or cavitation, and maximum output pressure fault monitoring for blocked or obstructed pipes. The CFW-08 operates in two control modes, V/F and Sensorless Vector. The V/F mode is suited to variable torque loads and includes a selectable energy saving feature, which reduces motor losses when operating at lower speeds. It is this control mode that enables the drives to operate in multi-motor applications where multiple (up to four) pumps are controlled by a single variable frequency drive. The alternative operating mode, Sensorless Vector Control, allows the drive to precisely control the speed and torque of a motor, enabling the CFWO8 to be used on demanding duties such, as Extruders, Conveyors and, Rewinders, for example. In addition to the standard CFW-08, WEG has recently launched an IP56-rated version- the CFW-08 Wash. The CFW-08 Wash is designed for applications in food, beverage, chemical and water treatment industries that require a higher degree of protection against the ingress of contaminants, providing effective safeguarding against the ingress of dust and water. Baginto AB bakery in Sweden also has been able to upgrade its mixing and dough preparation equipment, improving productivity and flexibility at very reasonable cost thanks to Lenze SMD and SMVector IP65 inverter drives. The highly compact SMD drives are ideal for retrofitting in existing panels at the bakery, whilst the IP65 rating of the SMVector drives enables them to be mounted directly to stainless steel surfaces without the cost and complexity of control cabinets. In addition wiring is greatly simplified as the drives can be mounted closer to the motors they control. The recent investment means that many areas of the bakery are now controlled by Lenze variable speed drives. The conveyors and rollers on Baginto's biscuit production line are equipped with Lenze SMD drives. The compactness of these drives makes them ideal for these applications. Supplied as retrofit units, they are providing smooth torque operation and fine speed control where machines already have control cabinets: the cabinets themselves are stainless steel due to the hygiene requirements in food production industries. The flour mixing and dough folding equipment at the bakery also now employ variable speed operation; benefiting both the consistency and quality of the product. At these stations, the drives had to satisfy a requirement to allow manual adjustments to the mix during production. This meant that they had to be both visible and accessible, and close to the machinery that is usually moved around as part of the production process. The IP65-enclosed SMVector drives provided the ideal solution. Their inbuilt levels of protection against contamination meant that they could be mounted directly to the mixer and the rollers, onto stainless steel frames, without the requirement for an additional cabinet with its attendant space requirements, additional wiring, and cost.